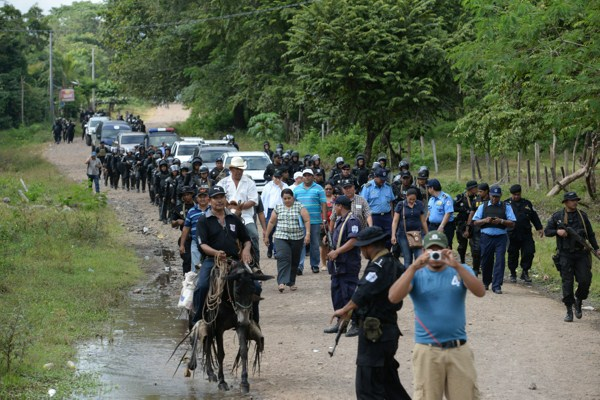 Riot police enter the town of El Tule, Nicaragua after they cleared a roadblock erected by residents to protest against a proposed transoceanic canal, Dec. 24, 2014 (AP photo by Oscar Navarrete). In late December, nearly 100 years to the day after the Panama Canal first opened for business, Nicaragua broke ground on Central America’s second mega-canal project, the aptly named Nicaragua Grand Canal. Billed as the world’s largest engineering project, it will snake 173 miles across Nicaragua upon its projected completion in 2019, providing a wider, deeper alternate route between the Atlantic and Pacific oceans for ships too large to transit the Panama Canal, several hundreds of miles to the southeast. The new canal, which will stretch three times the length of the Panama Canal, promises to not only alter the dynamics of global shipping, but also fundamentally transform—for better or worse—the future of Nicaragua, a nation of 6 million and the second-poorest in the Americas.